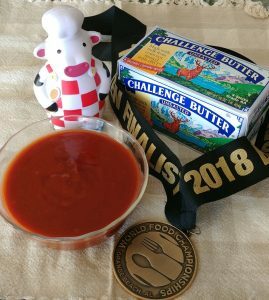 Disclaimer: I was provided vouchers for free Challenge Butter for my competition cooking but the opinions expressed here are my own. The “whole” enchilada was part of my final burger entry at the World Food Championships. I had already placed 5th to move to the TOP TEN Round. As I was standing on stage with the best burger chefs in the country, I thought could this night get any better-it did. I won 1st place in the Mushroom Council Bonus Bucks Burger Challenge! That’s a quick update on my amazing WFC journey this year. What does this have to do with Enchilada Sauce? I used my homemade enchilada sauce for my final burger entry, The “Whole Enchilada” Burger Quesadilla. 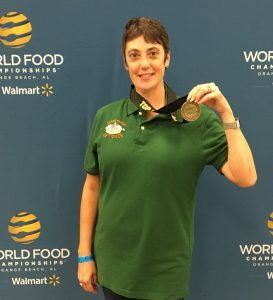 I took a creative gamble and while I didn’t win with it, it did put me among in the TOP TEN World Food Champions! So for me, that is a BIG win. Making my enchilada sauce so close to Thanksgiving gave me so many ideas to use it for turkey leftovers! Here’s my recipe for easy homemade enchilada sauce. I like making homemade sauces so I can keep an eye on the sodium level. I do have one secret for a rich, smooth sauce: Challenge Butter! It’s 100% real cream butter and goes from the farm to the fridge in two days! I use the unsalted butter to make a beurre manie’ (kneaded butter with equal parts flour and room temperature butter) A beurre manie’ works “like” a roux as a thickening agent. Unlike a roux, however, the flour is not cooked and it is added in the end to thicken a sauce much like cornstarch. It adds a nice richness to the sauce. In a skillet, add seasonings and drizzle with olive oil. Toast seasonings over low heat until they resemble coffee grinds, about 1-2 minutes. Stir in tomato sauce and beer. Raise heat to medium and simmer 10 minutes. Using hands, knead butter and flour together until fully encorporated. Raise heat. Bring to a boil. Whisk in kneaded butter and continue to whisk for 1 minute. Turn off heat. Let sit for 5 minutes before using. Can be stored in the refrigerator for up to 1 week. Put Your TO COOK IS TO CREATE Thinking Cap On: Want to jazz up the enchilada sauce? Add onions to sauté with seasonings. Want to up the spice? Add diced jalapenos or hot sauce. I not only plan on making leftover turkey enchiladas, but also adding the enchilada sauce and turkey to any leftover macaroni and cheese I may have. Think of using leftover turkey and enchilada sauce for an enchilada quesadilla like I did the burger or heating leftover turkey with enchilada sauce for a different turkey sandwich? I love leftovers in baked potatoes. How does leftover turkey, enchilada sauce, jalapenos, and cheese in a potato sound or how about tacos or nachos! Can never go wrong with nachos! Enchilada sauce would also be yummy for dipping turkey taquitos, too. Start planning for your Thanksgiving Leftovers now! 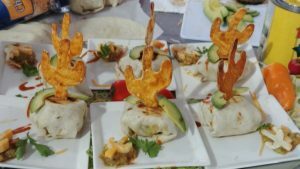 FOOD FUN: It goes without saying, competing in the World Food Championships and winning is beyond a dream come true. My mini-moo and I had some great adventures. Here’s a recap in case you missed it!